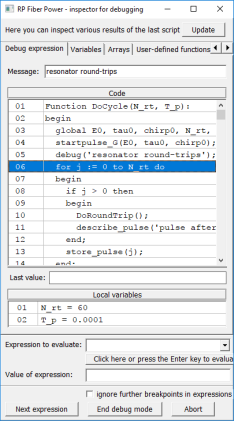 Ask RP Photonics to compute a complete list of critical phase matching configurations in your crystal, and for the calculation of all relevant parameters. Figure 1: Critical phase matching of second-harmonic generation in LBO. The polarization directions of fundamental (red) and second-harmonic wave (green) are perpendicular to the beam direction, and to each other. 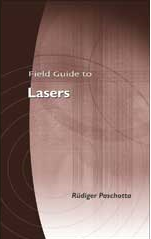 Critical phase matching (also called angle phase matching) is a technique for obtaining phase matching of some nonlinear process in a birefringent crystal. The interacting beams are aligned at some angle(s) to the axes of the index ellipsoid. In almost all cases, there are one or two waves polarized along one axis of the index ellipsoid (ordinary beam), while another one or two waves are polarized at some variable angle with the plane spanned by the other two axes (extraordinary beams). Adjustment of the propagation angle affects the refractive index of the extraordinary beam (called extraordinary refractive index), whereas the ordinary index stays constant. For some angular position, phase matching may be achieved. As an example, Figure 1 shows the beam direction and the polarization directions for phase-matched second-harmonic generation in LBO based on the type I scheme with polarizations oo-e in the XY plane. 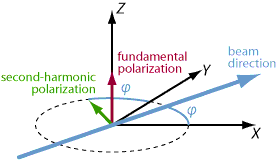 This means that beam propagates within the XY plane, the fundamental polarization is ordinary (o, here in the Z direction) and the second-harmonic polarization is extraordinary (e, with an angle φ to the Y axis). Figure 2 shows the required parameters. For example, for a pump wavelength of 800 nm the phase-matching angle φ would have to be 31.6°, and the effective nonlinearity would be 0.72 pm/V. The walk-off angle of the second-harmonic beam (not shown in the diagram) would be 16.5 mrad. 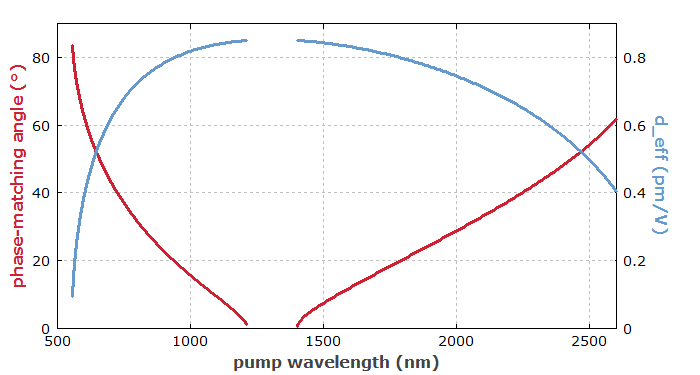 Figure 2: Phase-matching angle (red, left axis) and effective nonlinearity (blue, right axis) for critical phase matching of frequency doubling in LBO at room temperature, configuration oo-e in the XY plane. The angle shown is the angle φ in Figure 1. This phase matching scheme is suitable for frequency doubling from 1064 nm to 532 nm, but less so for shorter wavelengths due to the decreasing nonlinearity and the increasing walk-off angle (not shown). The attribute “critical” comes from the fact that this technique is relatively sensitive to misalignment of the beams. There is only a finite range of beam angles (the acceptance angle, also called angular phase-matching bandwidth) where critical phase matching works (in the example above, it is 0.67 mrad for a 1 cm long crystal). This also implies that the beam divergence must be limited, and this often forces one to use beams with a large beam radius. Efficient nonlinear conversion then requires a higher peak power. A related problem is the spatial walk-off between ordinary and extraordinary beams, which limits the effective interaction length and can spoil the beam quality. With sufficiently high optical powers, walk-off effects can be minimized by using a short nonlinear crystal and/or large beam diameters. A major advantage of critical phase matching is that the crystal temperature can often be close to room temperature, so that a crystal oven is not required.